LONDON--(BUSINESS WIRE)--The global internet of things security market is expected to post a CAGR of close to 49% during the period 2018-2022, according to the latest market research report by Technavio. A key factor driving the growth of the market is the growing adoption of cloud-based services in the IoT sector. As the devices connected to the IoT network are used for monitoring purposes in the consumer, commercial, and industrial sectors, they generate huge volumes of big data. This data is used to make significant business decisions, therefore, securing cloud-based services has become imperative. Many vendors in the market are offering product solutions and services pertaining to securing of the cloud, thereby driving the growth of the market. This market research report on the global internet of things security market 2018-2022 also provides an analysis of the most important trends expected to impact the market outlook during the forecast period. Technavio classifies an emerging trend as a major factor that has the potential to significantly impact the market and contribute to its growth or decline. Various technological advances in the global IoT industry, coupled with the evolving nature of attacks are resulting in the development of advanced technologies and applications for implementation in the IoT security industry. Companies are increasingly vouching for the implementation and use of AI and big data in the global IoT security market as they can detect any intrusion and take appropriate countermeasures against cyber-attacks. In addition to AI and Big data, companies are also vouching for blockchains, software-defined networks along with other technologies such as Edge Computing and Digital Twin Technology. Therefore, with such technological advances, the market is expected to show a positive outlook during the forecast period. “One of the major factors driving the market is the increased spending in the field of IoT security. Owing to the rise in the number of cyber-attacks, there has been a significant increase in demand for IoT solutions. As a result, to acquire sophisticated and security-enhanced IoT systems, companies are increasingly spending on quality end-to-end IoT security services,” says a senior analyst at Technavio for research on enterprise application. This market research report segments the global internet of things security market by end-user (industrial sector, commercial sector, consumer sector) and geographical regions (APAC, EMEA, and the Americas). The industrial sector led the market in 2017 with a market share of over 42%, followed by the commercial sector and consumer sector respectively. However, during the forecast period, the commercial sector is expected to show the highest incremental growth followed by the consumer sector. 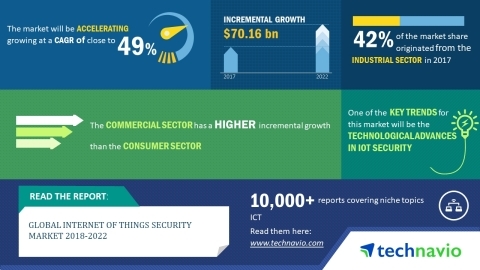 The global internet of things security market is expected to post a CAGR of close to 49% during the period 2018-2022, according to Technavio.